One thing that stands out about this shaver is its blade design that is meant to protect your fabric from damage. If you are looking for a fabric shaver for your travels then it will also fit the bill thanks to its compactness and the lightweight. 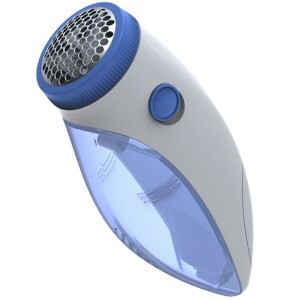 Therefore it is highly recommended for people who are keen on purchasing a fabric shaver for their travels. However, you will need to be careful how you use it since its handle design is not ergonomic and can lead to wrist injuries. It small and very lightweight making it very easy to operate during use for maximum efficiency. You can rest assured that your clothes will not be cut when the blades start running thanks to the metal blade guard that holds the blades away from the fabric. It is easy to operate with a simple on and off switch that is located on the side to make it easy power up the lint remover. It is easy to clean since the shaving compartment is removable to allow you to reach its innermost parts. It works with a variety of fabrics so you are not limited to using it with your clothes. The precision T blade design it comes with is very efficient when it comes to removal of the lints or stray threads thus can save you a lot of time. The design is not comfortable to hold while operating the fabric shaver and so can be a source of wrist injuries. The shaver head is not large enough to cover more space during shaving thus it will not save you much time.